Phase 1: In which Nick Lessins and Lydia Esperanza open Great Lake, a small pizza restaurant in Andersonville, Chicago, after years in other careers and years crafting the perfect pizza. They have specific ideas of the business they want to run. The place seats 12 or so, and offers three different pizzas, depending on available ingredients. 4 nights a week Lessins hand makes every pizza of finely curated toppings, taking time to carefully construct each one. Phase 2: in which Alan Richman declares to the GQ reading world that Great Lake is the best pizza in America. Phase 3: in which the demand for Great Lake pizza skyrockets and yelpers go crazy over long waits and pizza dough that runs out. Follow up articles ensue about customer demands, the yelp phenomenon, and the nature of business ownership ethics. NYTimes business blogger suggests they up their prices to deal with demand. Lessins and Esperanza respond they want to offer pizza at a fair price, that is affordable to more people. Phase 4: in which after a move to Chicago and some basic research, I try Great Lake pizza. I believe many good things are worth waiting for, but I also know I do not fare well waiting hours for food and often try to avoid such situations. And as we know, I do love unique pizza places. I had popped into Great Lake out of curiosity one Saturday night and quickly turned around. But yesterday was a special occasion, and I felt pretty confident that a rainy Wednesday evening would be much more suitable. Lowell and I arrived around 6 and could’ve been seated at the communal table immediately. I do love a good communal table, but this was date night, so we opted to wait for one (out of two) of the two seaters to open up. We headed across the street to a nearby bar and just as my champagne glass was nearly empty my phone rang to let me know a table was open. An ideal waiting experience if you ask me, multitudes better than waiting in a crowded lobby with one of those vibrating pager thingies. We ordered the salad and pizza number 3: spinach, homemade creme fraiche, spring onions, and cumin. The salad was a simple mix of many different greens (and flowers!) 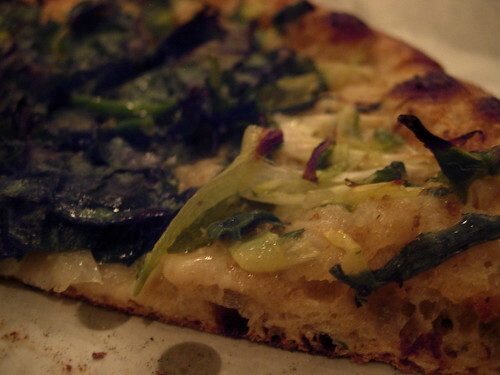 with pea shoots and curls of celery in a light mustard vinaigrette that was divine and perfect to share as we chatted and happily waited in anticipation for the pizza. I, being a sucker for details, noted and loved almost everything about the place, from the aprons the pizza purveyors wore to the water glasses to the linen napkins. (However, I’m not sure why, but something always feels off to me about a small “store” section in a restaurant, even if it includes Mast Brothers chocolate. But if that is part of their vision, go for it.) And then the pizza came. We tried very hard not to be biased by the hype, but as Lowell said, the pizza was a conversation stopper. We basically ate in blissful silence. The crust was at its crispiest at the center V and progressively added softness as you worked your way to the end of each slice. It was charred in all the right places and the toppings worked in fresh and perfect harmony. They pizza was a symphony. Phase 5: The present! in which, whilst doing pizza research right here, right now, I hear they are going to begin making breakfast sandwiches, and I almost die thinking of the breakfast sandwich version of that pizza. I came across this creamed corn with gorgonzola recipe on Eat, Make, Read, and had to make it. Luckily, Lowell had summer corn frozen in his freezer. But I had already planned on making pizza. Which led to the best summer (I know it’s not summer) pizza toppings of all time. I used Mark Bittman’s simple pizza dough recipe to make dough that only needed one or two hours to rise (although it contains no whole wheat). It wasn’t as easy and perfect as I wanted it to be (do I really need to invest in a pizza stone????). I’m still looking for THE pizza dough recipe. I baked it with tomatoes and finally topped with the gorgonzola creamed corn, toasted pecans, and fresh basil. 1. Mush the butternut squash with the flour, eggs, baking soda, salt, and pepper. 2. Melt some butter in a pan at medium heat. Place some sage leaves in the butter. 3. Spoon balls of squash fritter dough into the pan of hot butter. Cook for 4 mins or so until the bottom browns. Flip and fry the other side. Meanwhile, Black Bleans: Fry some onions in a touch of oil and a hearty sprinkle of cumin until onions are slightly browned. Combine with a can of black beans and some canned jalepeños. !Top Squash fritters with a scoop of black beans and a sprinkling of goat cheese. And don’t forget about the sage leaves! Leftover Squash Fritters for breakfast! 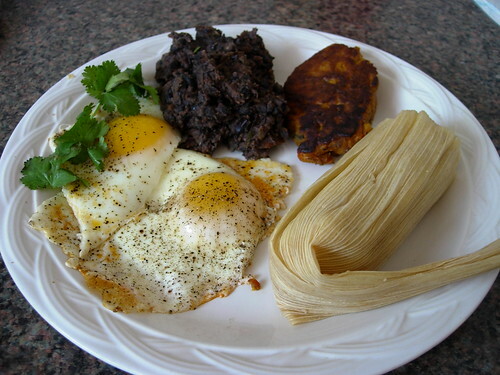 We refried the black beans the next morning to have with our reheated fritters, fried eggs, and cheese and jalepeño tamales (from a shop). As a breakfast dessert, we finally covered a squash fritter w/ cinnamon sugar as a sweet treat. 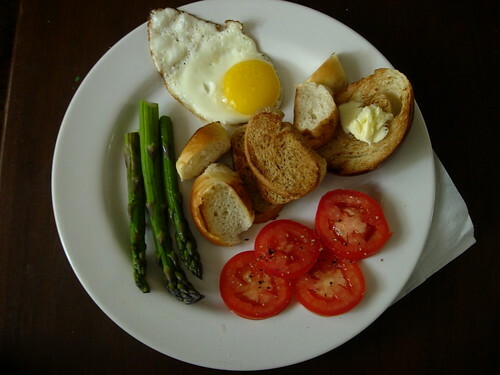 It was a phenomenal breakfast. 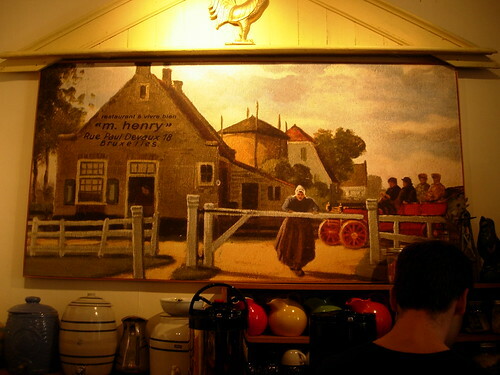 I went to breakfast at M Henry’s for the name. I will come back for the name and the breakfast. 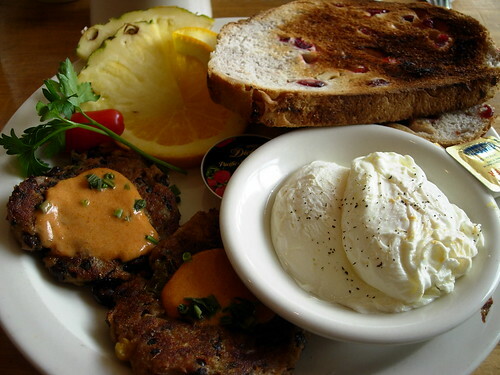 black bean cakes with some smoky chipotle sauce, poached eggs, and nutty, cranberry toast. As soon as we discovered that we could get a stack of steaming hot tortillas for less than a dollar at any time of day or night in our ‘hood, we started eating everything in corn tortillas. I think I may have become addicted. We made dessert tacos with queso fresco and guava paste or honey. 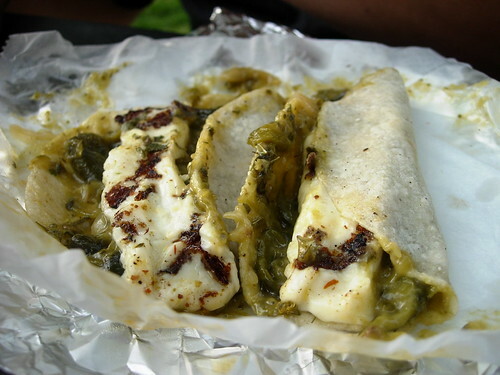 We made simple quesadillas with queso fresco and pepper. And we tried as many different savory tacos as we could. We bought carnitas by the pound in Pilsen, we ate fancy vegetarian tacos at Big Star, and we made amazing poblano peppers and portabello tacos at home. (As this is my last month eating meat, I also tried my first lengua/tongue taco, which luckily, did not become a new favorite.) Our fridge was always stocked with queso fresco, avocado, tomato, and cilantro. 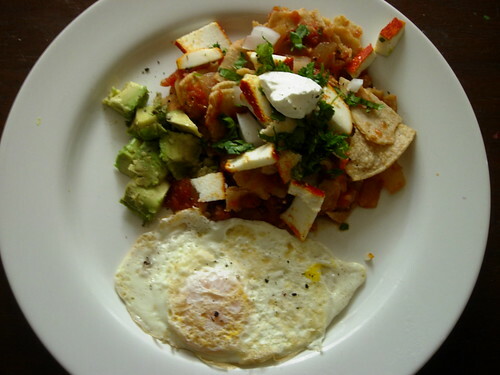 And when we couldn’t eat all of our fresh tortillas, we turned the stale ones into chilaquiles (see last post). What will I do without fresh tortillas? Rick Bayless is a Chicago celebrity chef, who recently cooked at the state dinner for the Obamas and The Calderóns of Mexico. He tried to highlight the American and Mexican cuisines, making Orgeon Wagyu Beff in Oaxacan Black Mole. Let me know if you make this. I, however, opted to try his recipe for Chipotle Chilaques, topped with queso añejo, avocado, and fried egg. Before Houston (Dec ’09) I had never tried Chilaquiles. Using this extremely facilisimo recipe, I was able to make the best I’ve ever had. Fabulous. 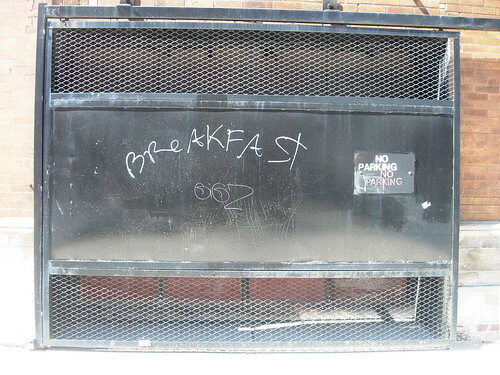 Who are you, Breakfast Graffiti person? 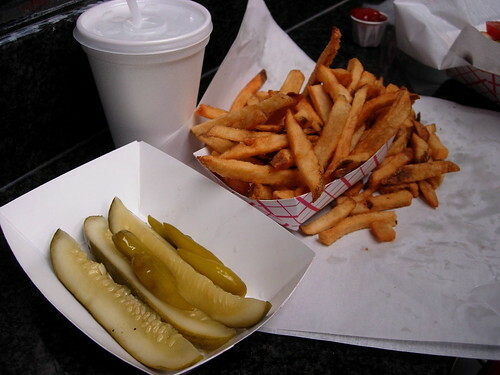 According to Wikipedia, Chicago’s The Weiners Circle is “famous for four things: its signature Chicago-style hot dogs, hamburgers, and cheese fries, and the mutual verbal abuse between the employees and the customers during the late-weekend hours.” I was warned against going. 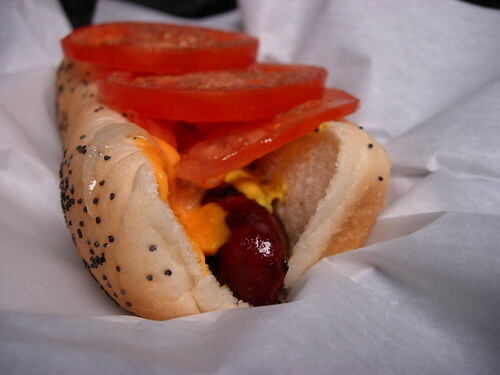 But I needed to try a Chicago char dog. Luckily, I went in the middle of the day, and no one yelled at me. This American Life (TV show) did a segment on the place, and I think that’s all the Weiner Circle experience I’ll ever need. The video makes me ill.